Tripoli, Libya: Islamic hard-liners have attacked about a half-dozen shrines in and around Tripoli belonging to Muslim sects whose practices they see as sacrilegious, raising religious tensions as Libya struggles to define its identity after Moammar Gadhafi's ouster. The vandalism has drawn concern at the highest levels as Libya's new rulers seek to reassure the international community that extremists will not gain influence in the North African nation. Mustafa Abdul-Jalil, head of the governing National Transitional Council, reacted with alarm to reports that graves were being desecrated and appealed to a top Muslim cleric, al-Sadek al-Gheriani, to issue a fatwa, or religious ruling, on the issue. He also called for restraint. "I ask those destroying these mosques to stop doing that because this is not the time to do that," Abdul-Jalil said Tuesday at a news conference. "What they did is not on the side of the revolution." The campaign appears to be aimed mainly at shrines revered by Sufis, a mystical order whose members often pray over the tombs of revered saints and ask for blessings or intervention to bring success, marriage or other desired outcomes. Hard-line Sunnis deem the practice offensive because they consider worshipping over graves to be idolatry. In one case, witnesses said dozens of armed, bearded men wearing military uniforms ransacked a Sufi shrine in Tripoli this week, burning relics and carrying away the remains of two imams, or prayer leaders, for reburial elsewhere. The assailants arrived in pickup trucks mounted with heavy weapons and stormed the gate to the compound housing the shrine, then dug up the two imams, identified as Abdul-Rahman al-Masri and Salem Abu Seif, and took the remains to be buried in a cemetery, according to the witnesses. Many residents in the Al-Masri neighborhood welcomed the attack, accusing worshippers at the shrine of practicing "black magic." Sufism is a mystical tradition in Islam. The order says its mission is to live a simple life of contemplation and prayer but followers are frequently targeted by extremists. Witnesses offered conflicting details, with some saying the attackers were heavily armed and came from other parts of the city and others saying it was a small group of unarmed locals. Abdul-Hamid al-Sunni, one of the residents, said the presence of the bodies had prevented people from the neighborhood from praying there. He claimed it was a small group of some 20 people that exhumed the bodies. He said residents had long wanted to get rid of the graves and he presented a petition signed by 120 people supporting the action, which began about 11 p.m. Sunday. Dirt and rocks were piled high around the empty graves that had been dug in the floor of the white and light blue building in Tripoli's al-Masri neighborhood. Blackened piles of ash and pieces of pottery were in the courtyard outside after the attackers burned relics and other items from the shrine, which sits next to a Quranic school in the same compound. "We need to build a new school here, a Quranic school, and we need to build a mosque and we need to build a small hospital for the area," al-Sunni said. The attackers then jumped back into their vehicles and drove to another neighborhood where they dug up the grave of a man who had built a mosque there and was buried inside. A shopkeeper in front of the al-Badri mosque who identified himself only as Mohsen said the men used hammers and shovels to exhume the remains, which they planned to bury in a cemetery. Mohsen said about 150 men blocked the roads leading to the compound and bragged about having come from al-Masri and planned to target more mosques. "They shouldn't have done this because the relatives had already applied to rebury him anyway," the witness said Wednesday in an interview outside his store, declining to give his full name because of fear of retaliation. Nader Omrani, who oversees religious affairs for the Tripoli local council, said three or four incidents had been reported in Tripoli and one in the town of Janzour, six miles (10 kilometers) to the west of the capital. "Because of the public condemnation and quick action by this council ... this conduct has been contained," he said Wednesday. Council members said the attacks were under investigation and it was not yet known who carried them out. But observers familiar with the issue blamed Islamic fundamentalists known as Salafists and said talks were under way to persuade them to stop. One man, who spoke on condition of anonymity because of the sensitivity of the issue, said many Libyans opposed Sufi traditions but did not want them handled violently. Al-Gheriani, who was a key supporter of Libya's revolution, said in an audio recording posted Monday on his official website that he opposes the building of shrines over graves but he does not sanction their removal, particularly as fighting continues on two fronts, stalling efforts to form a new government. "The country doesn't have a government with authorities imposed everywhere. Security is not prevalent, it is shaky and there are too many factions," he said, calling on groups to stop the attacks. "The time is not right. It may cause sedition ... and more bloodshed." Stephen Schwartz, the executive director of the California-based Center for Islamic Pluralism and a Sufi himself, said the act showed Islamic extremists were starting to make their move. He said the targeting of rival mosques and cemeteries has been used throughout history as a highly symbolic way to assert control. "It illustrates that there's a void ... and ... the radicals, the fundamentalists are going to try to fill that void," he said in a telephone interview. "They'll go where the opportunity is, where Muslims are divided and authority is weakened." 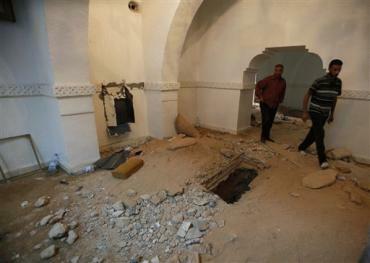 Picture: Libyans walk in front of an empty grave hole at the Shrine of Sidi al Masry, in Tripoli, Libya. Photo: Abdel Magid Al Fergany / AP.